Technology, politics and a breakdown of trust in media are conspiring to render objective truth meaningless. Can democracy survive a post-truth world? Among the most striking developments of 2016 was the extent to which politics came to be defined less by which policies we advocate, but which facts we believe. Political discourse has increasingly run aground over disagreements about what is and is not true before even reaching the substance of issues. The competition of ideas that makes democracy work is becoming an endangered species. Donald Trump’s supporters see Russian election hacking as a hoax promoted by the left and their allies in the media to discredit his victory. Meanwhile, Hillary Clinton’s partisans are convinced that Russia’s hacking not only happened, it delivered him the election. Both are wrong. Russian hacking probably did happen, but it’s not the reason Trump won. Because neither side can reach agreement on what reality actually is, they cannot reach meaningful consensus on what to do about it either. The rise of fake news and Donald Trump’s sometimes counterfactual rants, both on and off Twitter, have received a lot of ink. Yet, they are mostly symptoms of larger trends that are slowly killing truth. The economics of digital media is driving a proliferation of increasingly sophisticated clickbait designed to press our political buttons. Social media algorithms and news sources that cater precisely to our political preferences are creating ideological bubbles that expose us only to content that reinforces our pre-existing beliefs regardless of veracity. Media bias, real and perceived, is eroding trust in mainstream news sources. But, the lion’s share of the blame can be placed on our own intellectual laziness and unwillingness to consider information that challenges our assumptions. A free and independent press is democracy’s natural defense mechanism against the proliferation of nonsense. But, declining trust in mainstream news has rendered it impotent as an impartial arbiter of truth. 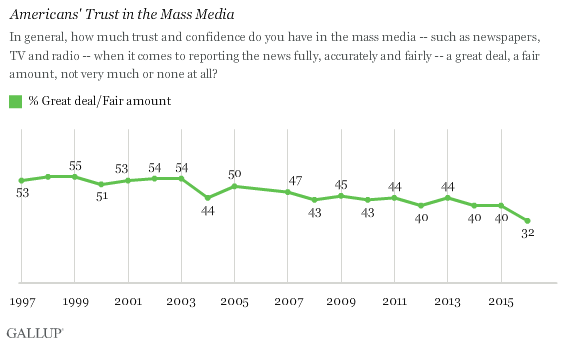 Less than a third of Americans (32%) now trust mainstream media, the lowest level recorded since Gallup began tracking it in 1972. Gallup, “Americans’ Trust in Mass Media Sinks to New Low,” Sept. 14, 2016. Some of this erosion of trust in media is self-inflicted. Facing stiff competition from a new breed of edgier news sources like Breitbart, BuzzFeed and Vox, old-line news outlets increasingly prioritize conflict, yawn at consensus, and present complex issues in ways more likely to provoke. While mainstream news has long given conservatives justifiable reason to complain of biased news coverage, 2016 took it to a whole new level. Politicians, including Donald Trump, must be held accountable. But, they must be held to an equal standard. 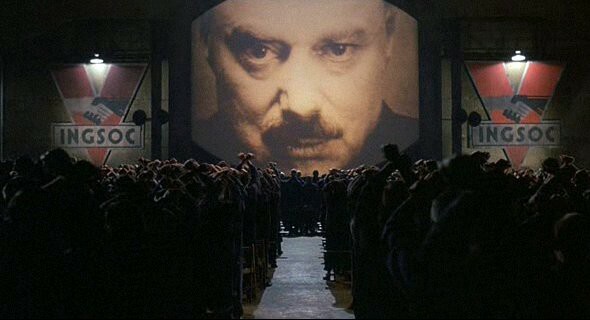 Yet, to paraphrase Orwell, when it comes to the media’s approach to Donald Trump some are more equal than others. An alien descending to earth would be hard pressed not to conclude that mainstream news outlets were pulling for Hillary to win. The near universal disdain for Trump on editorial pages and front pages alike is hard to miss. Revelations of cozy relationships between Hillary Clinton’s campaign and reporters further confirmed the suspicions of many conservatives (and Bernie Sanders supporters too) that the media was in the tank for Hillary. The media’s unanimous dismissal of Trump having any chance at victory appears in hindsight suspiciously like wishful thinking. Even after the election, media outlets continue to hold Trump to an inconsistent standard. For example, Trump’s recent refusal to accept daily intelligence briefings was met with resounding condemnation in the press, yet a few years earlier, news outlets defended President Obama when he was criticized for the same thing. When the media can no longer be depended upon as an objective arbiter of truth, differing versions of reality widen partisan gaps and destroy common ground upon which political leaders can find compromise. While there is much about Donald Trump that is worthy of scrutiny, in their zeal to expose Trump’s flaws journalists have too often seemed to drop the veneer of journalistic objectivity altogether. The inconsistent standard the media apply to Donald Trump not only infuriates his supporters, it justifies them in the belief that nothing in the press can be trusted. And that is a problem. A free press that can be trusted to distinguish fact from fiction is crucial to the proper functioning of democracy. When one thing is unfair or untrue, it is reasonable for people to assume that everything else might be too. Trust in media breaks down, fake news can flourish and politicians can lie without consequence. When the media can no longer be depended upon as an objective arbiter of truth, differing versions of reality widen partisan gaps and destroy common ground upon which political leaders can find compromise. In short, democracy breaks. ZeroHedge.com declares that it “marks a further curtailment of press freedom and another avenue to stultify avenues of accurate information.” But, once the layers of hyperbole are peeled back, this is wildly misleading. The truth is far more pedestrian. The provision established a “Global Engagement Center” at the State Department to coordinate various programs aimed at countering foreign propaganda such as the State Department’s public diplomacy functions and U.S. information services like Voice of America. The Center is directed at addressing the growing use of disinformation by foreign adversaries, not manufacturing propaganda aimed at the American people. Nothing in the provision that was just signed into law would “[curtail] press freedom and…stultify avenues of accurate information.” Quite the opposite. The objective is to expand access to accurate, independent sources of information in response to foreign efforts to spread disinformation. A more sober, factual version of the story is, however, unlikely to get much traction online. Dressed up in Orwellian clothes it is catnip for those pre-disposed to believe Barack Obama an aspiring tyrant. The version of the story posted on ZeroHedge.com has already racked up 59,000 shares and counting. By polluting the internet with grossly distorted interpretations of facts, it is ironically posts exactly like this that actually “stultify avenues of accurate information” far more than any Global Engagement Center ever could. The overwrought hysteria about Obama’s “Ministry of Truth” is emblematic of a trend of disingenuously repackaging real news to enhance its viral qualities and, it is hoped, draw traffic that can be sold to advertisers. The objective is not to inform, but to attract eyeballs and hold them long enough to convert them into revenue. It’s not “fake news” per se, but a close cousin that contains enough truth to appear credible, while clothed in enough hyperbole to attract the clicks, likes and shares to make it go viral. Call it “fake-ish news.” The objective is not to inform, but attract eyeballs and hold them long enough to convert them into ad revenue. Content providers may argue that this is just good business. But, it is also having a real impact on democracy. Whether we need another layer of bureaucratic coordination for U.S. public diplomacy programs and how appropriate government programs aimed at influencing oversees audiences are to begin with is a matter of legitimate debate. But, by blurring the lines between the real issue and the canard of a dystopian Ministry of Truth, “fake-ish news” ensures ensures that this a debate we will not have. It is not just fringe blogs that play the “fake-ish” news game. Revenue starved traditional media outlets also sometimes manipulate news in subtle ways that, while not technically inaccurate, evoke provocative if erroneous assumptions. The interview with Hussein’s eldest daughter Raghad, was mostly a reflection on her father’s rule and the Iraq war. There is little to no news value in what the daughter of a long-dead dictator thinks of Donald Trump. It is the headline mostly because it is coming from someone called Hussein, a name long tagged with pariah status. Right-leaning internet trolls use Barack “Hussein” Obama’s full name for the same reason. By referencing Hussein’s views on Trump, it is sure to get some shares among progressives. It is an editorial decision that while defensible, appears to be less about news and more about traffic. I know when I need to know more about Trump Saddam's daughter is the first person that comes to mind. I wonder what Hitlers kin think? These sorts of tactics may be a sign to things to come. As the financially troubled news industry seeks to shore up wobbly balance sheets, increasing their share of the digital advertising pie is critical. News outlets are increasingly dependent on digital ad revenue, by far the fastest growing advertising segment. A quarter of newspaper revenues came from digital last year. That is a huge jump from the 5% of newspaper ad revenue that came from digital a decade ago. Attracting larger audiences increasingly means luring people away from social media platforms like Facebook and Twitter where they spend the vast majority of their time online. According to a study published earlier this year, 6 in 10 Americans get news from social media and that number is certain to grow. News outlets have strong incentives to present content that entices people to click by playing up angles likely to invoke strong partisan reactions. It’s not just Macedonian teenagers and Russian hackers that are corroding the inner-workings of Democracy. The very same media outlets that have been contemptuous about fake news are also sometimes guilty of a tamer version of the same thing. None of this is good for democracy. As content providers get better at enticing us to click on their websites, news media blurs the lines of journalistic objectivity, and social media locks us into partisan bubbles, we get worse at doing our jobs as citizens and voters. There is no magic fix. A lot of the solution is up to us. Truth might not be completely dead. It is still possible to gain some reasonable measure of truth, it just takes more work. Accept that media bias exists, but don’t assume that everything you see is the product of it. Reading more than one source on the same topic helps add context and separate fact from biased conjecture. Be wary of outlandish conspiratorial claims, especially those that appear on obscure websites that deluge you with ads. Do some research and apply some common sense before accepting these claims as fact and sharing them on social media. Make a concerted effort to seek out smart opinions contrary to your own and consider them with an open mind. At worst, you’ll have greater reason for confidence that your point of view is correct. The availability of vast quantity of information in the 21st century equips us with better tools than anyone in history to determine what is true, but only if we choose to use them. The abundance of information also has a darker side that can make it harder to distinguish fact from fiction. More information means more bogus, misleading and downright deceptive information too. If we seek only justification for our beliefs, we will surely find it, even if what we believe is wrong. Dmitry Kiselyov, the Kremlin’s propagandist-in-chief, declared in a recent interview with The Economist that this means “[t]he age of neutral journalism has passed. It is impossible because what you select from the huge sea of information is already subjective.” Let’s all make it a point to prove him wrong. Judging from the sorry state of political discourse in this country, the darker side is winning. That is more of a threat to democracy than a thousand Russian hackers. Unless we put in the effort to see the world objectively and understand contrasting points of views, it is impossible to make the rational political decisions required of citizens in a democracy. It is uncomfortable to confront facts that challenge our deeply held views. But, our republican system of government only works when we have the courage to do so.